Nevin Aladag, Raise the Roof, 2007, still from a color video, 9 minutes. This recently formed gallery functions as a nonprofit project space, as well as a commercial venue that represents several young Turkish artists. Its second exhibition, “Emergency Exit,” explores tensions between tradition, prejudice, and assumed roles in society though drawings, paintings, and sculptures by six artists. The outlined figures in Nilbar Güres’s drawings mingle the act of household cleaning with participation in unusual sporting events and sexual fantasies. While Güres infuses freedom of expression and imagination into the mundane habitual experience of home organizing, she also exposes this very private sphere to a public, voyeuristic audience. Her drawings undermine socially constructed customs regarding women’s roles by revealing corporeal desires that are normally covered by a traditional appearance. Similarly, the paintings of Necla Rüzgar present hidden desires and temptations through depictions of sexual relationships that challenge culturally coded expectations in an explicit manner. 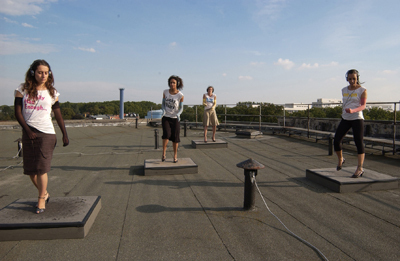 In the project room, Nevin Aladag’s video installation Raise the Roof, 2007, thrusts energy into the exhibition. Themes of escape and female expression appear again, but in Aladag’s work the exploration of an ecstatic form of freedom is made physical. The video depicts four women on a tar-covered rooftop, each preoccupied with her own thoughts while dancing to music played from personal headphones. In the heady abandon of the context, their stilettos tear at the roof’s surface, leaving a permanent impression of their footwork. While their individual actions create a sense of liberation from the crowd, they also unite the women in a shared passion and rhythm of movement.